Star Trek the Next Generation Season Four Blu-ray Review Classic 90's Star Trek at its best and all in all, Season 4 is easily one of the best seasons of Star Trek the Next Generation. Season 4 of Star Trek the Next Generation is considerably darker than the previous seasons due to the continuation of the cliff hanger of The Best of Both Worlds from season 3. 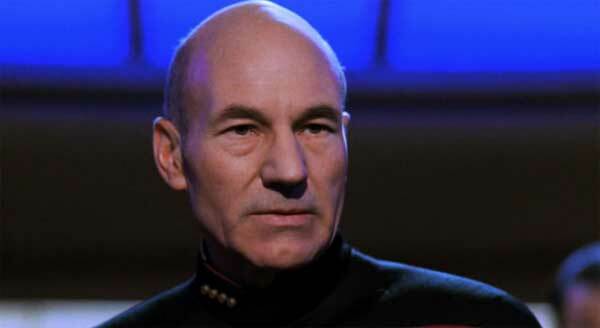 As the Borg threaten Starfleet, Captain Picard (Patrick Stewart) comprised, Commander Riker (Jonathan Frakes) is promoted to Captain in order to lead a last ditch attempt at stopping the Borg. 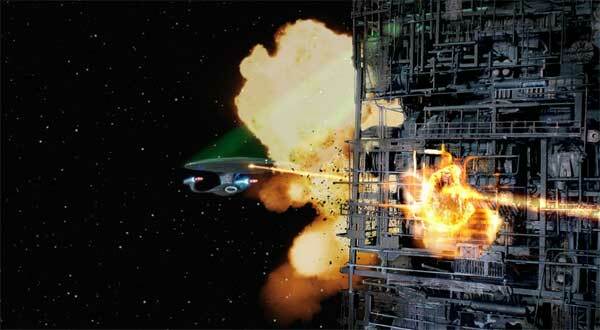 With thousands of casualties, worlds enslaved by the Borg, the crew of the Enterprise are left with both a physical and emotional scar from the repercussions. This season also sees the departure of Wesley Crusher (Wil Wheaton) and Lieutenant Worf (Michael Dorn) with the highlight of this season being the stories revolving around Data (Brent Spiner), Riker and Captain Picard due to the emotional storylines. Impressively, all 26 episodes of Season 4 are actually quite entertaining, especially those episodes that revolve around family such as Data's brother Lore, his creator Dr. Soong and when Captain Picard returns home after being rescued from Borg assimilation. 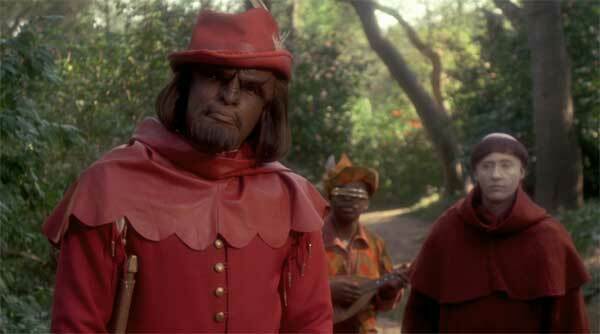 Thankfully not all episodes in Season 4 are dark such as the episode entitled Qpid which sees the almost godlike entity known as Q returning to torment the crew of the enterprise as he transports them into the world of Robin Hood. The last episode Redemption focuses on the Klingon homeworld which is another cliff hanger that results in Worf resigning from Starfleet and the biggest shock of all is that Denise Crosby returns to Star Trek but even though her security character Tasha Yar was killed off, she actually plays a Romulan Officer. It's one of those great Star Trek twists. Season 4 also paved the way for key elements in Star Trek Deep Space Nine such as Worf moving to this space station and the introduction of the Cardassians which are thankfully not the Kardashians. The star of season 4 is definitely Brent Spinner who creates this lifelike android, especially when he plays both his brother and father... what an actor. The episode "In Theory" is also quite a light hearted episode and still had smiling all these years later as Data goes on his first date. 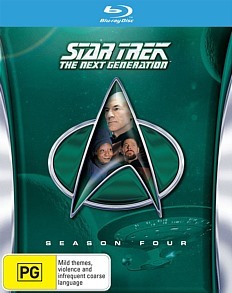 Paramount should be commended on such as perfect Blu-ray release of Star Trek the Next Generation Season 4. Not only is the video and audio quality outstanding, the special features are jam packed on this release and more importantly, they are actually very insightful to watch. The highlights for me was the Mission Overview Year Four which helped piece together key elements of this season and really help you understand the underlining links of the mythos. With lots of mini-featurettes, these special features could easily be watched again due to the amount of content included. Of course, you can never go past a gag reel and seeing the crew of the Enterprise mess up their lines and joke it around is almost worth the admission price alone. Brilliant! Selected Crew Analysis: Year Four - An in-depth look at the departure of Wesley Crusher; cast members discuss their experiences performing stunts; and a profile of Jennifer Hetrick as "Vash"
New Life and New Civilizations - An inside look at creating alien landscapes and shooting on location; also explains the challenges of shooting the effects-packed episode "The Best of Both Worlds"
Star Trek the Next Generation really went into high gear in Season 4 that definitely enhanced the original ideas of Star Trek creator Gene Roddenberry. Although I immensely enjoyed the latest Star Trek Into Darkness film, it was more a generic sci-fi action movie opposed to a metaphysical journey and advancement of humankind. On Blu-ray, the video and audio quality is terrific and almost appears that it was filmed yesterday. The only draw back with the video quality is that the sets look a little too cheap now but nonetheless the stories are still very powerful and I could happily recommend this release to all lovers of high quality sci-fi. Classic 90's Star Trek at its best and all in all, Season 4 is easily one of the best seasons of Star Trek the Next Generation.